My daughter has become very fond of things with wheels lately whether it’s bikes, trikes, scooters, stroller, shopping cart (she loves to push the shopping cart). She is getting to a point that she can play with all of these things. She is loving being able to push things. I figured that it was time to get her something with wheels. I found this Y-Bike GLX Pro Scooter!! Since my daughter is a little under 2 years old she won’t be able to ride it for a while, but I got a few of my nieces to be my testers. They all seemed to love it. The age recommended for this scooter is 5+up. -The way it glided. They said it was so smooth, even when they went on a bumpy sidewalk. -They loved how it looked so cool. Scooters are always cool, but the fact that it stood out from other scooters really got their attention. -The soft griped handle bars. The scooter was very easy to assemble. It came only in two pieces. All I had to do was the the handle bars in the slot they went and I was done. If you look at the above picture you will see that at the bottom of the handle bars are two things poking out on both ends. 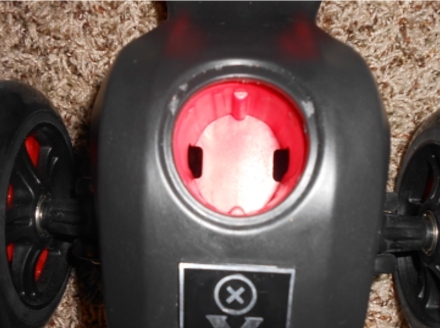 That is the part the you put in the hole (below picture) and they lock in place. It makes the scooter secure and makes sure the handles bars won’t fall off. The maximum weight that the scooter can hold is 110 lbs. I tried to ride it and I felt like I was going to break it. If you get this make sure you stay true to the weight limit. Another great thing is that the handle bars come out very easily. If your child wants to take it with them to a friends house or the park, it will save space in your car and is easy to transport. All you have to do is turn the scooter over and push the black buttons and pull and they will come out! The scooter can move up and down, it has 3 positions. The lowest position can definitely fit a 5 year old. My daughter can actually reach the handle bars at the lowest position. I do want to add that my 5 year old niece had a little bit of trouble using it. It was too hard to her to understand. The thing about this scooter is that to turn you have to lean. Normal scooters let you use the handle bars to turn. But this one you have to lean on the scooter. She couldn’t even turn with it. My 7 year old niece even had problems with it. But she was able to understand how to use it after a while. My 9 year old niece was really the only one that was able to understand it right away. So with practice all the girls were able to use it. And even when they couldn’t do it, they still tried hoping they’d learn how. Even though my daughter can’t ride it right now. She really loves to play with it. She always pushes it around and love to sit and stand on it. 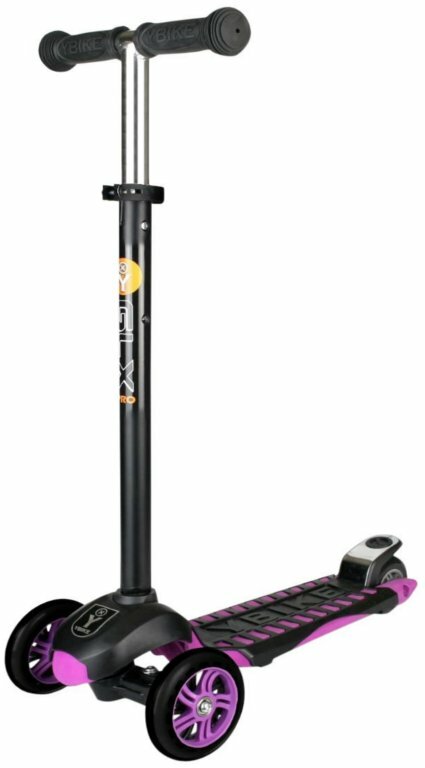 Right now you can buy the GLX Pro Scooter on their site Y-Bike for $99. You can also follow them on Facebook. Y-Bike is offering to give away (1) GLX Pro Scooter! Which happens to be just in time for the Holidays for the great Gift Giving! Open to USA, No Purchase necessary. Contest ends on November 18, 2013 at 11:59 pm EST. This promotion is in no way sponsored, endorsed or administered by, or associated with, Facebook. The winner will be selected and notified by email and will have 24 hours to respond back to original email with their shipping info or a new winner is selected. Good Luck! I like that there is two wheels in the front. I think it would help with balance. I think my children would have lots of fun with this scooter. Both of my girls 8 &11 would love this scooter. I love how cool it looks. My 7 year old little girl got a scooter for Christmas last year, and over the summer it fell apart. Was really disappointed in the low quality of it. This scooter looks very nice and well made, she would love to have one like that! I know my granddaughter would love it. My son would love one!! He has been begging for a scooter for Christmas!!! my daughter wants a scooter for xmas! this would be perfect! I like that it has three wheels…and the colors of course! My daughter’s current scooter is just about done…and I know she would love to have this one~! I like that it has the 2 wheels in the front, maybe a little safer than the 2 wheel scooters. So cool looking!!!!! Nice color. My step daughters would love this to ride around on! The 5 year old is still a little small for her bike so something like this would be perfect for her so she could keep up with her brother and sister! My son would love this! I like that it has 3 positions, Maybe the little girls could also share it, when my son is not using it! I like that it’s easy to assemble. I also like the colors! I’ve never been able to afford one for my own kids. But would love to win this for my grandson. Thanks for the giveaway. I like the 2 wheels in the front more steady that way! Both of my kids would love this. And probably fight over it!! My kids would go wild for this. My little one has the smaller version and won’t get off it! I love that it looks more sturdy for little ones as compared to other scooters! My 4 year old son would love this so much! My kids would DEFINITELY LOVE this!! I adore the wider and grippy board base. Some scooters are just too skinny and make me nervous. This would be perfect for my beginner! Thanks for the chance to win. Easy assembly is a major plus! My daughter would LOVE this..WE LOVE THE COLORS!! Black will be good to disguise scuff marks..unlike her pink razor she has now ..that is rusted. My daughter would love this scooter and I like that it is a space saver and easy to travel with. My kids would love everything about this scooter! I like that it has 3 positions so all 4 of my children could use it! My daughter would love this. I like the dual wheels on the front, I think it would provide a bit more stability compared to a razor. I love that it comes apart easily and seems sturdy and safer than some others. My granddaughter is 4 and she would love it! My kids would flip if I won this! I would have to buy a second one just so they wouldn’t fit over it! LOL Great alternative to bike riding! It’s nice that the scooter can hold up to 110 lbs, so we would get a lot of use out of it. I love that it has 3 positions to grow with my kiddo! My son is always riding his cousins scooters. So one of his own will make his excited. My grandson would love this. I like it because it looks safe and well balanced! I know a little boy who would love this! My grandkids would love it & I like that it’s not as tippy as others! My son would love this and it looks nice and durable!! I’d love to win it for him! I like that my little one won’t lose her balance easily. My kids would love this scooter! The kids would love it because it is smooth gliding and looks cool. My girls would love this. I like that it is easy to assemble and looks well made. I also like that And I like that it is made for all age groups. My kids would love it! And I would appreciate the extra stability that an additional wheel provides. This would be fun for my 5 year old son. I like that it can be easily assembled and disassembled for transportation. My granddauter would love it and so would Grandpa for the easy assembly. My three year old daughter would love this for Christmas!! Great scooter! My daughter has been wanting one of these so bad. Her birthday is at the end of this month, what a treat it would be if she was getting this. Good luck to all! My 6 yr old would love it! An it doesn’t look babyish like the other 3 wheeled scooters out there! Yes my son would love it. I like that the scooter can move up and down and has 3 positions. Ian would like this- I like that it has 3 positions. I know a few kiddo’s that would love this!! !…I like the colors and that kids can still use is as they grow!!! Nice and portable and safer than other scooters! I really like that the handle comes out for transportation or storage. Great idea! My daughter & her best friend would love it! My kids would love this! The bright colors and smooth ride would make them very happy!! My son would love this!!!! I love that it is so portable and easy to take around. my granddaughter would love it. Hers was stolen out of our yard, so she has been without one since July. I like it because it looks so cool! I think my son would love the fact it glides. My daughters would love this I like that its easy to assemble. Love the fact it has 2 wheels to stabilize it. Less risk of them falling over and getting hurt. I love that it comes in purple that is my daughters favorite color. Which is who it would be for. Love this one as it easily comes apart, thus, transporting it would be so easy! We love going to parks and trails, this feature would be perfect to have! This is perfect for my 4 year old. I like the three wheels to help with stability! I like the three positions so it can grow with her. I like that it will get them some exercise outside. I had lots of fun on my scooter when I was a kid. My niece would too. My grandsons would enjoy this scooter! I like how easy it looks to assemble and I love that the wheels look like they ride so smooth! I like how it’s so compact. My boys would love this! I like that it is easy to assemble and the design is very cool! My dd would love it! I like that it’s not just 2 wheels! Dd gets so frustrated when she can’t balance and this would be the perfect starting point for her to learn how to ride a scooter! My grandson would love this. I like that it has 3 positions and that it’s easy to assemble. My grandchildren would love it. I have a 5, 8 and 10 yrs. old so one of them will be able to conquer it. I love how easy it is to take apart to travel with. My 4, 6, & 9 year olds would love this scooter! I would love the portability of it! My grandson also likes anything with wheels. I like the fact that it has 3 wheels, so the children shouldn’t tip over as easy. I love the color and this would be perfect because my daughters scooter just broke so we don’t have the money to replace it. I would probably win this for either one of the younger ones….they are 3 and 5. My five year old daughter would love to have this! I like that it has the two wheels in the front of it! Love the fact that it is adjustable, so it can grow w/a child (or to let a Sibling ride too!) My grandson would love this – & he’s really great about sharing, so his little Sis could learn to ride too!!! TY4 the chance…. Oh they would go crazy, I like it safes room in car, they like bringing bikes, scooter with them. little ones busy for a while, lol. My son would go banana’s for this scooter. I like that it is easy to assemble. My son is a quick learner when it comes to these kinds of things. Thanks for the chance. My 4 yo would this scooter! She likes anything with wheels. My four year old daughter would love this. She always wants to be like her 3 older brothers. This gift would be great. Would love this for my Grandson~I am on SSI and such a limited budget. Just trying to get lucky with some gifts. She would love it. I like the colors. My kids would love this. We already have one scooter, and they fight over it all the time. I think 3 wheels are more stable compared to 2 wheels because it only takes a small pebble to stop the 2 wheel type. my son would love this scooter! I love the colors it comes in. 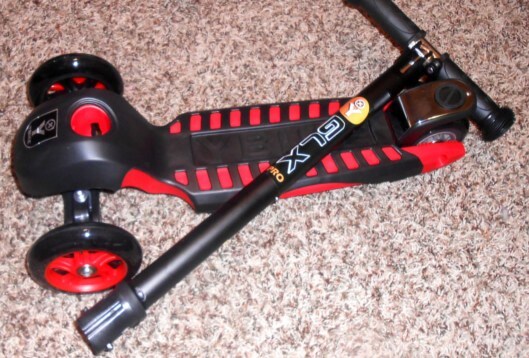 Omg my Son Would Love this Scooter its so cool !!! Not only would both of my boys love this scooter, but I would too!! I love the way it packs away and would be really easy to put in the car on trips. The only problem I can see with this is who would get to use it first!! This would be perfect for my granddaughter. I like that it looks sturdy. This would be perfect to get the kids out of the house and get some exercise. Mine would love it! It just looks cool. My son would love this…he gets in trouble from his big sis for taking her scooter all the time! I like the design, pretty sharp lookin. My kids would love this scooter. Looks solid and fun to ride. My nieces would love this & I like that the scooter can hold up to 110 lbs. The colors! She would love purple or pink! Wha a exciting christmas day gift! My kids would love this scooter!!! I’d give it to my nephew, he’d really like it. Love the 3 wheels! My daughter would love it! He would LOVE it. One of the things I like best is the scooter can move up and down andhas 3 positions to accommodate different age ranges! My daughter would love this! I like that it has 3 positions! My youngest would love this. I like that it has two wheels in the front and looks a lot steadier than most. I like how you have to lean to maneuver it! My daughter loves hers!! I would love to win one for my son! My daughter would absolutely love! Oh this would be a great gift for my daughter or great niece! Thanks for the entry! My cousin would love this scooter. I like how cool it looks too. I like the 3 wheel design, and my son would love this scooter. I love that it can fit and grow with my 6 year old! my son has been asking for a scooter all year. Love that the handle bar is adjustable. I like that it’s adjustable. Our son would LOVE this! He is obsessed with his big sister’s scooter. It would be nice to have him play safely alongside her with this awesome scooter. My 9 year old son would love this, he’s about worn out is old one and this looks a little safer than the one we have now. Thanks for the opportunity. My 5 year old grandson would just love to be riding this…he would love how cool it looks! My niece would love this because it looks girly! She loves to play with her brother, but she is still a girly girl! My grand-daughter would love to ride this and I would love to watch her happily riding it. I like the 3 wheels. It seems to be stable and safe. I would love for my daughter to play on this. I like the cool colors. This would make a nice Christmas gift under the tree. I like that the handle bar is adjustable. I think my daughter would really like this scooter. And I know she would like the color. My son would love this scooter. It is on his list! My kids would love this. I love how stable it appears. What a great gift to keep at Grandma’s house for the grandkids to share. My grandson would love this! I like that it has three wheels. My kids have never owned a scooter. It’d be a novelty, and my 6 year old daughter loooves purple. I would love to win this for my friend’s granddaughter. She is so sweet and lovable. The design is so much cooler than what was available when my kids had them. My oldest son would love this, well maybe in a couple months. Would be a good birthday present for him 🙂 I like it because it seems smooth to ride for kids. I love that it’s compact and available in several colors! My son would love this! He’s been asking for a scooter and this one looks awesome! I love that there are three positions to move it up or down. I like that the handle bars can be removed for transporting! My nephew would love this scooter. I definitely like that it is easy to dissembled in case you want to transport it in your vehicle. I like that the board is in one piece (where she puts her foot). My 4 year old daughters currently have one with a cartoon character on it and it is in two pieces and they get their foot caught near the handle all the time. This is a much better/safer design. This is awesome! 3 wheel design is fabulous! My daughter would love it. I really like the colors. I am so glad I found this review, have been trying to figure out if I should get this scooter vs the maxi micro. This review has been the most helpful so far . my daughter would love it.the design looks great. i have twin 7 years old daughters that would love this! My 6 year old would love this!! I like this toy because it gets the kids outside and off the video games and TV!! I have four granddaughters and every one of them would love this scooter. I really like that it has the three wheels and it has a smooth glide to it. Also looks pretty cool. My 5 yr old twins would love this! My niece would love this. I love the color and design. My 5 yr old twins would love this. I Like that the scooter is easily transportable and adjustable. I like that it has three positions to accomodate their height and that it can fit in my car nicely. I would love to win this for my 11 year old grandson. This scooter is so cool looking I now he would love it. My kids would probably love it so much and try to ride it even when the snow falls! My niece asked for a scooter for Christmas, I think this one would be nice, love the colors. my neice wiuld love this and I like how much safer it looks from other scooters plus love the purple. My daughter would love this. I like the fact that it rides smoothly, even on bumpy roads. Omg this is awesome! My son can’t balance himself on a regular one. I love how it turns. I love that it is different than their other scooters. My boys would LOVE this! I have 6 boys, and 3 of them could ride it now, and still have 1 to grow into it. It would get a TON of use at our house! I like that you have to lean into the turn to make it turn. I also like the look!! My boys love skateboards, scooters, etc. They would have a blast with this!!! I would love this for my grandson. He loves anything with wheels! These scooters are awesome! The design and adjusting handle is great. My girl would love it. I would love this for my daughter.. help her learn balance control. 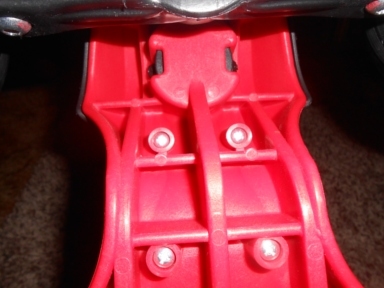 I like the fact that it’s adjustable and it looks like the base has some traction. I usually worry that my kids’ feet will slip off if it’s too smooth. My son would love this scooter. He used is other one so much that he wore the wheels out. This one looks more durable. I like the fact that it has 3 wheels on it. Although I was first looking at it for 1 of my granddaughters ,I think it would be a much better fit for my grandson. I love the colors and the safety rating. Like that it is for younger kids and my granddaughter would love it! I love that I can adjust the height easily so that all the kids can ride it! My boys would love this scooter and I would love that they would be exercising while have fun. My son would LOVE this! and i love that it’s affordable! I love the three wheels on this scooter.I feel it is safer and easier for children to ride. he would be ecstatic if he won this… I love everything about it! My daughter wants a new scooter from Santa 😉 great giveaway!!! My daughter has been wanting a scooter she would definitely love it. I love that the weight limit is 110, so maybe I can ride too lol! I think my daughter would love this scooter. If I win this I would give it to her on her 6th birthday in February. It noT only looks cool I like how it comes in two pieces so it is easy to put together! I like that it has three wheels although you have to lean it still seems more balanced than the regular scooters. My son would love this scooter! The design is awesome and I love the black and red color combo. Def. would love to give this to my son for Christmas. I love the color..unique look..cool style.my daughter would love love love this. Oh he would so love this! I like that the handle bars come off easy and I love that it is geared to younger kids. My Pinterest name is: Andrea Hamilton. I like that the handle can detach for easy transport. Both my 3 &4 year olds would love this they have asked Santa for it. Would love to have this for my Grandson. He would absolutely love it. I LOVE THAT THE HANDLE BARS COME OUT!!! my daughter would LOVE this. I love the fact that I can easily pack it up and bring it with us when we go to park! My daughter would love it! I love that it’s not the typical princess scooter or razor. This would be perfect for a 5 year old I know that has a great deal of energy. He would just love it, and I wouldn’t have to worry about his balancing a bike. My daughter would love this! I really like the color and design on this! I children would love this. I like that this has the 2 front wheels so it will not tip over easily. This scooter is so awesome, it would get my son to flex his body and and lean into it to move. Also love the fact its easy to travel with too. Totally awesome scooter. I love the Y part of this scooter because my daughter would probably have an easier time riding it. Thanks! My children would love to try and kill themselves on this!!! I love how much more stable it looks to be than a regular razor scooter which will make broken legs and skinned faces much harder to accomplish!! My daughter who will be 5 in April would love one of these! Especially for Christmas! I can not afford one at the moment for her due to being unemployed! She does love to ride her older sisters razor scooter! The smooth ride is important to me, and to my kids!!! They would love this!! I would certainly get lots of extra fun mommy points if I could win this for our 4 children!! My son would be excited if he had one of these! It would be some exercise for him vs. use of our stroller going to preschool and back. I like everything about the scooter. My granddaughter would love this so much. All of my kids would enjoy the scooter but mostly my daughter who is 5 she’s always on her friends. I hope to get one of these for my son. He will LOVE it. He has special needs so it it hard to find him a scooter that he can ride but this’s one looks perfect!! I’m sure most of my children would be able to enjoy this scooter. I like that it folds up so it doesn’t take up too much space. I love the colors. It’s also nice that it is on two pieces and easy to carry. This would also make for easy storage. I would love to win one of these for my nephew! My daughter would just love this! She really wants something like that! Thanks so much for doing this great giveaway! My 6 year old son & 8 year old daughter would love one of these!! I love that the handle bars come out easily to save space! I like that it can moved in different positions to fit the rider. and the Handle bar removes easily so your child can take it along with them to a friends/ relatives house!! Thank you a million times. I’m very excited and I know my grand daughter will be too.